One of the major problems I’ve had over the years fishing tubes is how often they get hung up using a standard tube jig. Whether you’re fishing in the rocks, or wood cover they just seem to catch on everything. To solve this, I’ve gone out of the box so to speak. The Jika Rig (pronounced Zee-ka), offers a new way of presenting snag proof soft plastic baits to bass, and one of my favorite baits to use for this rig is the tube. Tube fishing is one of the best ways to catch smallmouth and largemouth bass on the planet and if you were to ask Al Lindner, he’ll tell you a green pumpkin tube is his absolute go-to bait for smallmouth bass fishing on any lake in North America. 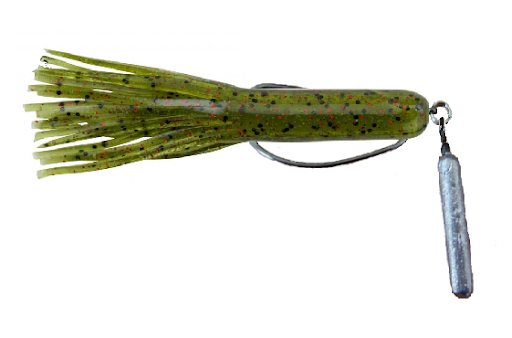 For me it’s a green pumpkin or brown craw here on the Pend Oreille River for them beautiful pre-spawn ditch pickles. effective, as it can imitate these very well also. 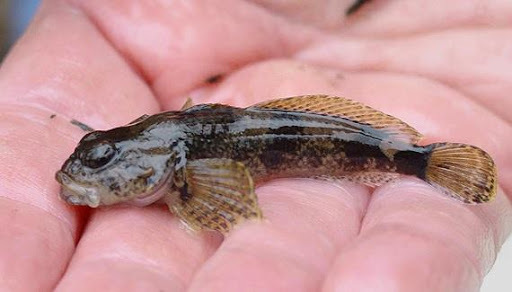 Here is what the Banded Sculpin native to our waters looks like. Both Largemouth and Smallmouth eat them by the ton and a tube is a perfect imitation of these somewhat ugly little critters and I think one of the best ways to present them is the Jika Rig. You can make your own Jika rigs by attaching a split ring to the eye of a Gammy EWG hook and hang a finesse dropshot weight from it. Just tie your line to the split ring not the eye of the hook. I go down as small as a #2 EWG hook for the smaller Gitzit tubes and up to a 3/0 for the bigger tubes. I use split rings and weights to match the size of the hook and the bait with the conditions I’m fishing. In general I use a ¼ or 3/8 oz dropshot weight with small tubes and a ½ oz. up to a 1 oz. on large tubes fished in deep water. One of the primary benefits of using a Jika Rig is sensitivity. It allows for a more direct connection between you and bottom, which helps you feel bottom composition and transitions. Traditional tube riggings tend to dampen the overall sensitivity of the rig, making it more difficult to feel bottom. While we are talking about tubes right now, keep in mind that you can use this presentation with a variety of different soft plastic baits. Worms, creature baits, flukes, craws and swimbaits can all be Zika Rigged to various effects. It offers a different “look” than what the fish are used to seeing. What are some good places to fish the Jika Rig? You can fish them in the same types of areas you might otherwise fish a dropshot rig or a standard tube. Look for transitions in bottom composition, whether it’s a hard-to-soft bottom transition, sand-to-weed transition, or even a dark-to-light color change on the bottom. All of these areas tend to attract bass. The beauty of this rig is in its versatility. You can easily change out weights to adjust of the depth your fishing or your desired drop speed. It can be fished on a spinning rod or a baitcasting rod, depending on your personal preference. 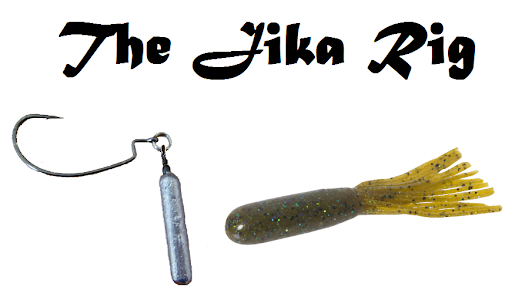 The Jika rig is perfect for dragging tubes as it keeps the bait on the bottom without the fear of getting hung up and dragging tubes is really quite simple. 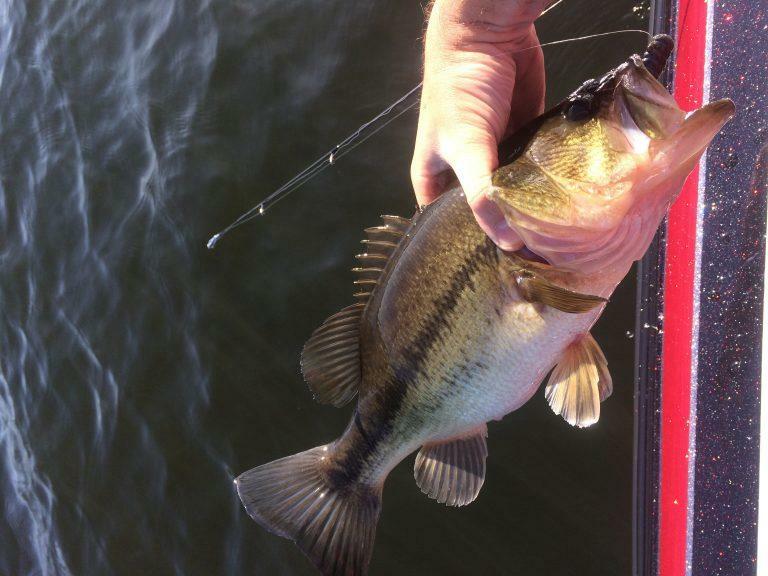 You essentially drop a plastic grub to a lake's bottom in areas likely to be holding bass, and use your trolling motor to drag the bait across the bottom while also maintaining constant contact with structure. I like to crawl my baits very slowly with a long pause in colder water moving the bait only a few inches at a time. One day a few years ago I went fishin in late March and it was blinding cold outside. Dressed in my insulted coveralls and armed with my hot coco coffee, black licorice and a box of doughnuts, I hit the river for a little bank fishing. My standard tube dragging equipment at the time consisted of some ¼ to ½ oz. tube jigs, and some 2” Gitzit tubes to 3.5” Strike King Coffee tubes. I hiked down to my favorite early spring Largemouth hole and cast a tube to the spot on the spot where I knew the early spring largies would be. As soon as the bait hit the bottom I had a nice fat 3lb bass on. My next cast I only crawled the bait about a foot and it was hung up. Since I was bank fishing you can’t just move to a spot you can pull the bait loose like you can in a boat, so I broke that off, retied and cast again. In my next 10 casts I got 4 fish and broke off 6 times. I knew there had to be a better way when I remembered an article I had read a few months prior about a new rig. I couldn’t remember what it was called, but I did remember what it basically looked like. So I looked through my tackle and found some long dropshot weights and a few smaller than average EWG hooks. I took a small split ring off a crankbait and attached it to the EWG hook and put the weight on it and rigged up my tube I was using Texas style. Well I landed 10 fish from 2 to 5 lbs in a row without one break off and I knew I was on to something. Since that experience, I have been fishing that odd rig with a funny name with great success in places that a normal tube rig would get hung up every time. 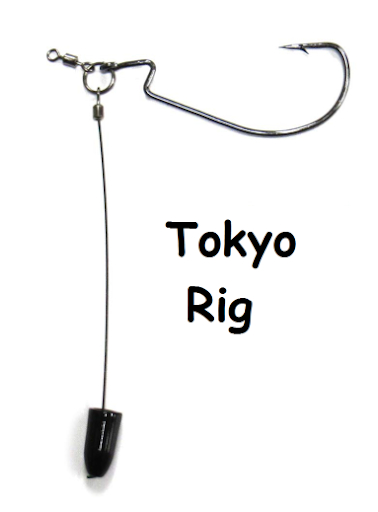 There is also another version of this rig called a Tokyo rig that the weight is on a wire about 2 to 4 inches long. I haven’t tried this rig yet, but I plan to this coming year to see if I like it any better than what I have been using. I hope you guys will try both the Jika rig and this other one to see what you like best.